I'm implementing a 2D physics engine where collision response is based on impulse computation. I'm going to first expose the context, then the problem, and finally the questions. Simple collision between two solids, the first one is static, the second one falls. The second solid has its colliding face parallel to the second solid. 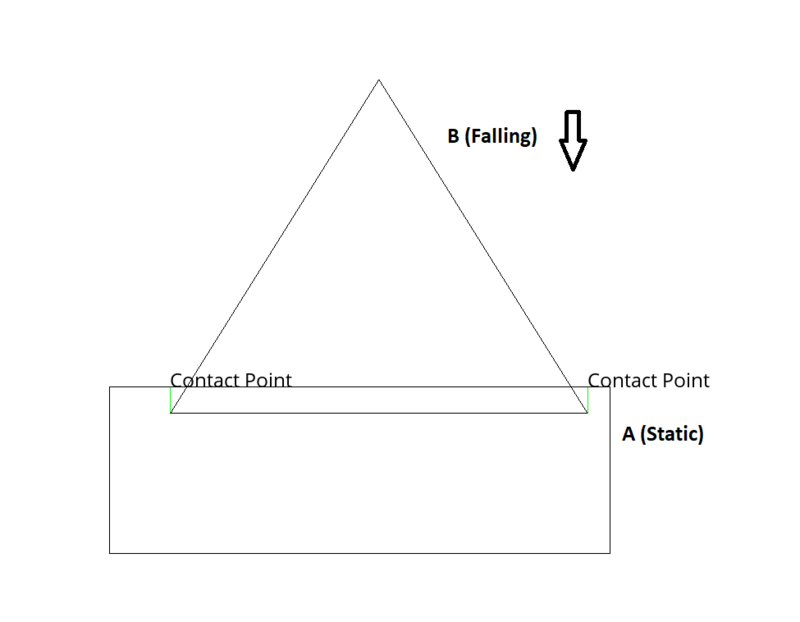 Two collisions point are generated (one at each side of the second solid colliding edge). Given two solids A and B who collided. \$\vec Va\$ is the vector from A's center of mass to one Colliding Point. \$\vec Vb\$ is the vector from B's center of mass to one Colliding Point. \$\vec N\$ is the collision normal. \$Ia\$ and \$Ib\$ are inertia tensor in world space of solids A and B. If I only take the linear speed into account, the second solid falls on the static one and bounce upward (the resulting velocity post collision is positive on the y axis). If I take the linear and the angular speed into account, the second solid falls on the static one but doesn't bounce (the resulting velocity post collision is still negative on the y axis). Am I right to state this is not normal that, because colliding faces are parallel and only B is moving down, B should bounce no matter if we take angular speed into account (A only performs translation, no rotation)? If I'm right, I guess that can be due to the way I consider how the pointCoeff variable is used in the algorithm. Do you have any suggestion or piece of advice ? Browse other questions tagged collision-resolution physics-engine or ask your own question. Do two balls of different mass bounce different heights?